Seth Middleton, Shelby County Farm Bureau president, met with Jared Dilley instead of Representative Jim Jordan of Ohio’s 4th congressional district, who was unable to make the meeting, for his congressional visit on Capitol Hill. Middleton is the Assistant Vice President AgriBusiness Banker at Heartland Bank in Columbus. A Shelby County Farm Bureau member, he helps run the family’s grain and hay operation in Sidney. Middleton said his biggest concerns are water quality and trade affecting Ohio. He asked Dilley how “common grounds across the aisle” can be accomplished in Congress. He also said that increasing broadband and higher internet speeds in rural Ohio areas “could allow farmers to do things they haven’t able to do before,” referring to the farmers who do not have fast enough internet connection to use farm machinery which depends on high tech internet connection. Middleton also asked Dilley what Jordan’s general thoughts were about water quality. “We’re not saying we’re the entire problem, but agriculture is a part of the [water quality] problem and we’re here to say we’re going to take care of it,” said Middleton. https://www.rurallifetoday.com/wp-content/uploads/sites/56/2019/04/web1_DilleyCongressionalVisit-2.jpgLeft to right on the couch, Gene Daniel, Seneca County Farm Bureau president; Seth Middleton, Shelby County Farm Bureau president; John Hafer, Marion County Farm Bureau president; and Gary Mescher, Mercer County Farm Bureau president. 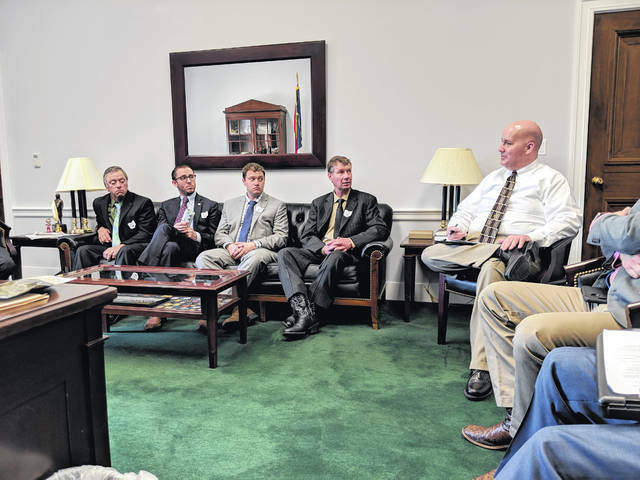 They spoke to Jared Dilley, in place of Representative Jim Jordan of Ohio’s 4th congressional district, during the group’s congressional meeting at the 73rd Ohio County Farm Bureau Presidents’ Trip to Washington, D.C, March 14.